Can you imagine what it would be like jumping out of a plane, 12,000 feet in the sky and experiencing the incredible rush as you dive into the air and freefall towards the earth at 120mph? Now think about the tranquility when the canopy opens, gliding until your feet finally touch the ground. Take part in our Big Jump and this amazing experience will become a reality! Imagine standing at the edge of an open doorway of an aircraft flying at 12,000 feet – the noise of the engines and the wind ringing in your ears with only the outline of distant fields below. Now imagine leaning forward out of that doorway and letting go – falling forward into the clouds, diving down through the air as you start free-falling at over 120mph! Then …. peace and quiet as the canopy opens, the steering toggles come down either side of you and you begin a tranquil parachute descent from a mile up in the air, steering yourself back down to the centre of the drop zone below. Sound amazing? Imagine being able to do this for FREE whilst harnessed to a professional free-fall parachute instructor and at the same time being able to help an anti-bullying charity! The technical term for the jump is a ‘Tandem Skydive’. It is a Skydive because you will be free-falling through the air (without the parachute deployed) for several thousand feet; it is in Tandem because you will be harnessed to a professional parachute instructor at all times throughout the descent. This is literally the chance of a lifetime! Free-fall down to 5,000 feet – falling through the air at 120 mph! The tandem skydive you must be at least 16 years old. There is no upper age limit but if you are over 60 years of age, you will need to complete a pre-assessment at the centre before your booking is accepted. The weight limits are 15 stone for men and 13 stone for ladies. Everyone doing a tandem skydive will be required to complete a medical form. You will be required to sign a medical form before your jump declaring your fitness to take part – this will be sent to you along with your booking form. Those under the age of 18 will need the medical form signed by a parent or guardian; those with a medical condition will need it signed by their doctor. 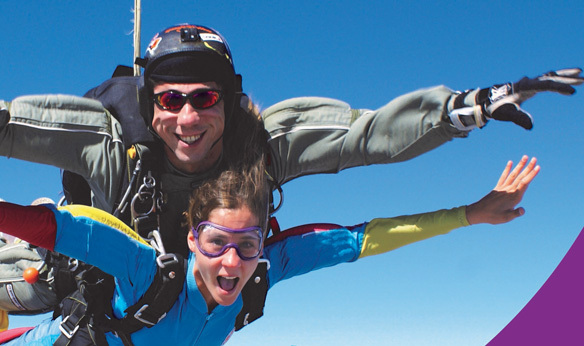 Reserve your Charity Sky Dive space! Disclaimer* I/We understand that I/we will be taking part in this event entirely at my/our own risk and will attach no responsibility to the organising body in the event of any injury or material damage. I confirm I am 16 years old or over and sign on behalf of myself and on behalf of the individuals in my party. We will use this information to contact you regarding the Sky Dive and you can also contact us at fundraising@bulliesout.com or if you have any questions, please visit http://www.skydiveswansea.co.uk/faq/. Once your online form has been received, you will be sent a booking form which will need to be completed and returned to Swansea Skydive along with your deposit of £50. 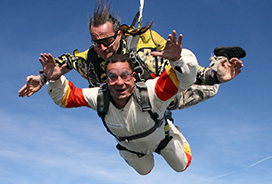 You’ll receive training on the day of your sky dive by our partners at Swansea Skydive. 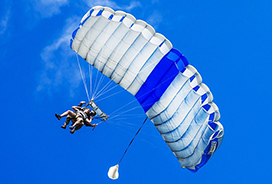 You’ll be harnessed to a professional parachute instructor who controls the free fall, parachute opening and landing. So be brave and enjoy. Please note: BulliesOut are not involved in the organisation of the skydiving event. 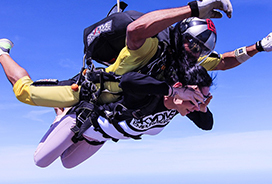 Your contract is with Swansea Skydive which organises the event and arranges your skydiving experience. Your entry fee is paid to Swansea Skydive and the Charity does not benefit from these payments. The Charity benefits from the sponsorship raised along with related donations. The Charity disclaims all liability in respect of the skydiving event, save for that which is caused by the Charity’s negligence. BulliesOut advises you to take reasonable steps to confirm that you are content to take part in the skydiving activity with Swansea Skydive.